Welcome back to our series on Colonizing the Solar System! Today, we take a look at the largest of Saturn’s Moons – Titan, Rhea, Iapetus, Dione, Tethys, Enceladus, and Mimas. We have written many interesting articles on colonization here at Universe Today. Here’s Why Colonize the Moon First?, How Do We Colonize Mercury?, How Do We Colonize Venus?, Colonizing Venus with Floating Cities, Will We Ever Colonize Mars?, How Do We Colonize Jupiter’s Moons?, and The Definitive Guide to Terraforming. Astronomy Cast also has many interesting episodes on the subject. Check out Episode 59: Saturn, Episode 61: Saturn’s Moons, Episode 95: Humans to Mars, Part 2 – Colonists, Episode 115: The Moon, Part 3 – Return to the Moon, and Episode 381: Hollowing Asteroids in Science Fiction. The Cronian system (i.e. 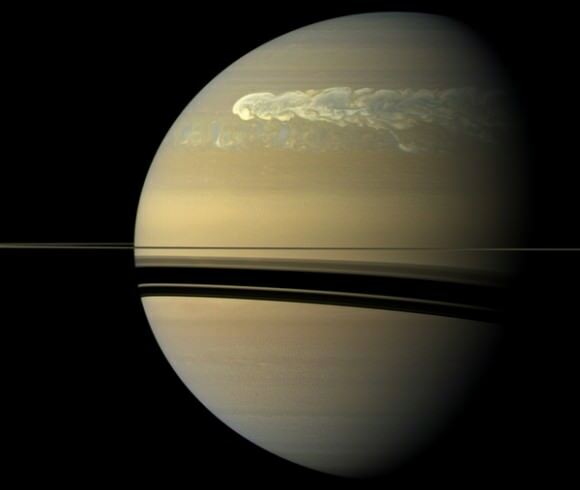 Saturn and its system of rings and moons) is breathtaking to behold and intriguing to study. Besides its vast and beautiful ring system, it also has the second-most satellites of any planet in the Solar System. In fact, Saturn has an estimated 150 moons and moonlets – and only 53 of them have been officially named – which makes it second only to Jupiter. For the most part, these moons are small, icy bodies that are believed to house interior oceans. And in all cases, particularly Rhea, their interesting appearances and compositions make them a prime target for scientific research. In addition to being able to tell us much about the Cronian system and its formation, moons like Rhea can also tell us much about the history of our Solar System. Rhea was discovered by Italian astronomer Giovanni Domenico Cassini on December 23rd, 1672. Together with the moons of Iapetus, Tethys and Dione, which he discovered between 1671 and 1672, he named them all Sidera Lodoicea (“the stars of Louis”) in honor of his patron, King Louis XIV of France. However, these names were not widely recognized outside of France. In 1847, John Herschel (the son of famed astronomer William Herschel, who discovered Uranus, Enceladus and Mimas) suggested the name Rhea – which first appeared in his treatise Results of Astronomical Observations made at the Cape of Good Hope. Like all the other Cronian satellites, Rhea was named after a Titan from Greek mythology, the “mother of the gods” and one the sisters of Cronos (Saturn, in Roman mythology). With a mean radius of 763.8±1.0 km and a mass of 2.3065 ×1021 kg, Rhea is equivalent in size to 0.1199 Earths (and 0.44 Moons), and about 0.00039 times as massive (or 0.03139 Moons). It orbits Saturn at an average distance (semi-major axis) of 527,108 km, which places it outside the orbits of Dione and Tethys, and has a nearly circular orbit with a very minor eccentricity (0.001). With an orbital velocity of about 30,541 km/h, Rhea takes approximately 4.518 days to complete a single orbit of its parent planet. Like many of Saturn’s moons, its rotational period is synchronous with its orbit, meaning that the same face is always pointed towards it. With a mean density of about 1.236 g/cm³, Rhea is estimated to be composed of 75% water ice (with a density of roughly 0.93 g/cm³) and 25% of silicate rock (with a density of around 3.25 g/cm³). This low density means that although Rhea is the ninth-largest moon in the Solar System, it is also the tenth-most massive. 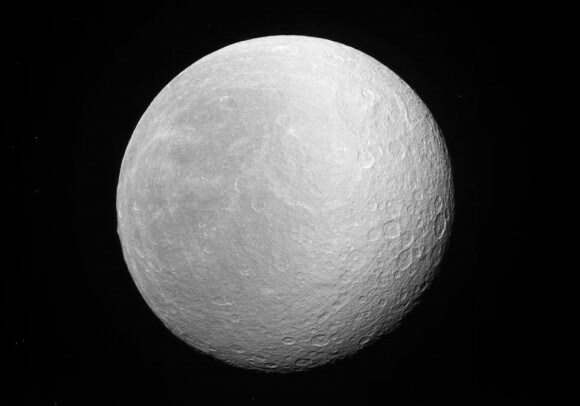 In terms of its interior, Rhea was originally suspected of being differentiated between a rocky core and an icy mantle. However, more recent measurements would seem to indicate that Rhea is either only partly differentiated, or has a homogeneous interior – likely consisting of both silicate rock and ice together (similar to Jupiter’s moon Callisto). Models of Rhea’s interior also suggest that it may have an internal liquid-water ocean, similar to Enceladus and Titan. This liquid-water ocean, should it exist, would likely be located at the core-mantle boundary, and would be sustained by the heating caused by from decay of radioactive elements in its core. Rhea’s surface features resemble those of Dione, with dissimilar appearances existing between their leading and trailing hemispheres – which suggests that the two moons have similar compositions and histories. Images taken of the surface have led astronomers to divide it into two regions – the heavily cratered and bright terrain, where craters are larger than 40 km (25 miles) in diameter; and the polar and equatorial regions where craters are noticeably smaller. Another difference between Rhea’s leading and trailing hemisphere is their coloration. The leading hemisphere is heavily cratered and uniformly bright while the trailing hemisphere has networks of bright swaths on a dark background and few visible craters. It had been thought that these bright areas (aka. wispy terrain) might be material ejected from ice volcanoes early in Rhea’s history when its interior was still liquid. However, observations of Dione, which has an even darker trailing hemisphere and similar but more prominent bright streaks, has cast this into doubt. It is now believed that the wispy terrain are tectonically-formed ice cliffs (chasmata) which resulted from extensive fracturing of the moon’s surface. Rhea also has a very faint “line” of material at its equator which was thought to be deposited by material deorbiting from its rings (see below). Rhea has two particularly large impact basins, both of which are situated on Rhea’s anti-Cronian side (aka. the side facing away from Saturn). These are known as Tirawa and Mamaldi basins, which measure roughly 360 and 500 km (223.69 and 310.68 mi) across. The more northerly and less degraded basin of Tirawa overlaps Mamaldi – which lies to its southwest – and is roughly comparable to the Odysseus crater on Tethys (which gives it its “Death-Star” appearance). Rhea has a tenuous atmosphere (exosphere) which consists of oxygen and carbon dioxide, which exists in a 5:2 ratio. The surface density of the exosphere is from 105 to 106 molecules per cubic centimeter, depending on local temperature. Surface temperatures on Rhea average 99 K (-174 °C/-281.2 °F) in direct sunlight, and between 73 K (-200 °C/-328 °F) and 53 K (-220 °C/-364 °F) when sunlight is absent. The oxygen in the atmosphere is created by the interaction of surface water ice and ions supplied from Saturn’s magnetosphere (aka. radiolysis). These ions cause the water ice to break down into oxygen gas (O²) and elemental hydrogen (H), the former of which is retained while the latter escapes into space. The source of the carbon dioxide is less clear, and could be either the result of organics in the surface ice being oxidized, or from outgassing from the moon’s interior. Rhea may also have a tenuous ring system, which was inferred based on observed changes in the flow of electrons trapped by Saturn’s magnetic field. The existence of a ring system was temporarily bolstered by the discovered presence of a set of small ultraviolet-bright spots distributed along Rhea’s equator (which were interpreted as the impact points of deorbiting ring material). However, more recent observations made by the Cassini probe have cast doubt on this. After taking images of the planet from multiple angles, no evidence of ring material was found, suggesting that there must be another cause for the observed electron flow and UV bright spots on Rhea’s equator. If such a ring system were to exist, it would be the first instance where a ring system was found orbiting a moon. The first images of Rhea were obtained by the Voyager 1 and 2 spacecraft while they studied the Cronian system, in 1980 and 1981, respectively. No subsequent missions were made until the arrival of the Cassini orbiter in 2005. After it’s arrival in the Cronian system, the orbiter made five close targeted fly-bys and took many images of Saturn from long to moderate distances. The Cronian system is definitely a fascinating place, and we’ve really only begun to scratch its surface in recent years. In time, more orbiters and perhaps landers will be traveling to the system, seeking to learn more about Saturn’s moons and what exists beneath their icy surfaces. One can only hope that any such mission includes a closer look at Rhea, and the other “Death Star Moon”, Dione. We have many great articles on Rhea and Saturn’s system of moons here at Universe Today. Here is one about its possible ring system, its tectonic activity, it’s impact basins, and images provided by Cassini’s flyby. Astronomy Cast also has an interesting interview with Dr. Kevin Grazier, who worked on the Cassini mission. For more information, check out NASA’s Solar System Exploration page on Rhea. Peekaboo! Tethys makes a (mostly in vain) attempt to hide behind Rhea in this picture taken by the Cassini spacecraft a couple of years ago, but highlighted by NASA in a recent picture essay. Besides the neat view of the orbital dance, one thing that is clearly visible between the two moons is the different colors — a product of their different surfaces. It turns out that Tethys’ bright surface is due to geysers from another moon. Below are some other pictures of moons dancing around Saturn — some harder to spot than others. All images were taken by the Cassini spacecraft since it arrived at the planet in 2004. Three of Saturn’s moons bunch together in this image by Cassini. Credit: NASA/JPL/Space Science Institute. Click for larger image. If you hang out in Saturn’s intense magnetic environment for a while, it’s going to leave a mark. That’s one conclusion from scientists who proudly released new maps yesterday (Dec. 9) of the planet’s icy moons, showing dark blotches on the surfaces of Dione, Rhea, and Tethys. Cassini has been at Saturn for more than 10 years, and compared to the flyby Voyager mission has given us a greater understanding of what these moons contain. You can see the difference clearly in the maps below; look under the jump and swipe back and forth to see the difference. So what do these maps yield? Radiation-burned hemispheres in Dione, Tethys, and Rhea. Icy deposits building up on Enceladus from eruptions, which you can see in yellow and magenta, as well as fractures in blue. Dust from Saturn’s E-ring covering several of the moons, except for Iapetus and Tethys. Could these be used by future explorers seeking life in some of these moons? In the meantime, enjoy the difference between Voyager’s view in the 1980s, and Cassini’s view for the past decade, in the comparison maps below. A caution about the maps: they are a little more enhanced than human vision, showing some features in infrared and ultraviolet wavelengths. “Differences in color across the moons’ surfaces that are subtle in natural-color views become much easier to study in these enhanced colors,” NASA stated. This picture is from a couple of years ago, but still worth the extra look. The Cassini spacecraft — busily circling Saturn and gathering data on the ringed planet and its moons — managed to grab five of Saturn’s 62 known moons in one shot. The European Space Agency highlighted the picture on its home page this week. From left to right, you can see Janus, Pandora, Enceladus, Mimas and Rhea. Don’t be fooled by the rings near Rhea; those are actually Saturn’s rings. Rhea is just blocking the view of the planet from Saturn’s perspective during this picture portrait, which was taken on July 29, 2011. The cornucopia of moons around Saturn is part of what makes that particular planet so interesting. Titan, the largest, is perhaps the most well-known because of its strange orange haze that intrigued astronomers when the twin Voyager spacecraft zoomed through the system in the 1980s. Cassini arrived in 2004 and revealed many more moons to science for the first time. Color-composite of Titan made from raw Cassini images acquired on April 13, 2013 (added 4/17) NASA/JPL/SSI. Composite by J. Major. “The dozens of icy moons orbiting Saturn vary drastically in shape, size, surface age and origin. Some of these worlds have hard, rough surfaces, while others are porous bodies coated in a fine blanket of icy particles. All have greater or smaller numbers of craters, and many have ridges and valleys,” NASA wrote on a web page about Saturn’s moons. And new discoveries are coming out all the time. Earlier this year, for example, astronomers said that the moon Dione could have had active geysers coming from its surface, such as what is likely happening on Enceladus. Check out this gorgeous new portrait of a Saturnian moon quintet taken by Earths’ emissary – NASA’s Cassini Orbiter. The moons are majestically poised along a backdrop of Saturn’s rings, fit for an artist’s canvas. Janus, Pandora, Enceladus, Mimas and Rhea are nearly lined up (from left to right) in this view acquired by Cassini at a distance of approximately 684,000 miles (1.1 million kilometers) from Rhea and 1.1 million miles (1.8 million kilometers) from Enceladus. The newly released image was taken by Cassini’s narrow angle camera on July 29, 2011. Image scale is about 4 miles (7 kilometers) per pixel on Rhea and 7 miles (11 kilometers) per pixel on Enceladus. This view looks toward the northern, sunlit side of the rings from just above the ring plane. Rhea is closest to Cassini here. The rings are beyond Rhea and Mimas. Enceladus is beyond the rings. The simple graphic below shows dozens of Saturn’s moons – not to scale. So far 62 have been discovered and 53 have been officially named. Aegaeon, Aegir, Albiorix, Anthe, Atlas, Bebhionn, Bergelmir, Bestla, Calypso, Daphnis, Dione, Enceladus, Epimetheus, Erriapus, Farbauti, Fenrir, Fornjot, Greip, Hati, Helene, Hyperion, Hyrrokkin, Iapetus, Ijiraq, Janus, Jarnsaxa, Kari, Kiviuq, Loge, Methone, Mimas, Mundilfari, Narvi, Paaliaq, Pallene, Pan, Pandora, Phoebe, Polydeuces, Prometheus, Rhea, Siarnaq, Skadi, Skoll, Surtur, Suttung, Tarqeq, Tarvos, Telesto, Tethys, Thrym, Titan and Ymir.